The traffic light pulsing like a heartbeat at the intersection of Alaska Street and Evergreen Avenue gives Palmer a definite small-town feel. And though nestled in Alaska’s fastestgrowing borough, the town retains its charm and friendly pace. Still, it’s far from sleepy. Each autumn, Palmer is home to the Alaska State Fair, but throughout the year farmers markets, community celebrations, parades, and popular cafes, restaurants, and boutique shops keep things hopping. In 1935, when Alaska was still a territory and the Great Depression ravaged the nation, 203 families traveled from the Midwest by train and ship to reach the Matanuska Colony, an experimental farming community formed under President Roosevelt’s New Deal. They lived in a tent city at first, then began farming individual 40-acre tracts. About 6,500 people call Palmer home today. 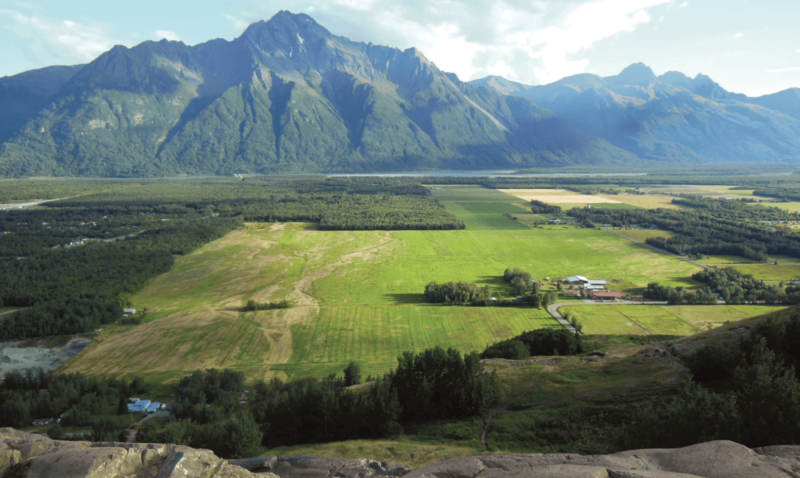 The town’s roots are firmly planted in the fertile soil near the mouth of the Matanuska River, and farming still defines the Matanuska region. Chances are good that if you buy Alaska-grown potatoes in a grocery store around the state, the tubers came from the Palmer area. The Palmer-based Alaska Farmland Trust preserves arable lands for future generations through land conservation measures—they’d rather see young farmers continue to supply local food to fellow Alaskans than a field full of new houses. Pyrah’s Pioneer Peak Farm, a “u-pick” just 10 minutes from Palmer, offers rows upon rows of broccoli, cabbage, lettuce, onions, kale, and more for those willing to pick their own and pay by the pound at a lower price than farmers markets. And once harvest time swings into high gear, local outdoor markets such as the Friday Fling at the historic Palmer train depot overow with fresh carrots, tomatoes, cucumbers, and peas as well as eggs from happy chickens and honey from busy bees. In addition to farming, Palmer loves a good celebration. David Cheezam, owner of the independent Fireside Books on Palmer’s main drag, has been in business for 15 years and has seen hundreds of parades go by. Colony Days, a mid-summer fete, includes a parade, cooking contest, and fun run. Colony Christmas has a craft fair, cookie and gingerbread house contests, triathlon, Christmas lights contest, and yes, a parade. e biggest celebration of the year, however, is the Alaska State Fair. Held at the Alaska State Fairgrounds just south of downtown Palmer, the annual state fair generates excitement beginning months before the launch of the 12-day spree that has everyone drooling over giant smoked turkey legs, grilled corn-on-the-cob, and gourmet ice cream bars; attending outdoor concerts (sometimes in the rain—but that doesn’t stop Alaskans); squealing with delight at cute piglets; and betting it all on the rat race. Oh, and then there’s the shopping: whether you enter from the red, yellow, or purple gate, wide paved paths such as the Green Trail and Miners Loop lead through a maze of hundreds of vendors selling everything from hamburgers to henna. People check the state fair website early to get tickets to see headliners, which included the likes of KC and the Sunshine Band in 2014, Daughtry in 2015, and Cheech and Chong this year. And don’t forget the rides. Even if the temperature drops—it is fall, after all—and termination dust appears on Lazy Mountain, Matanuska Peak, and Pioneer Peak, hardy residents just bundle up and keep on screaming their way through the thrills on the carnival midway and strolling through the exhibit barns to see blue-ribbon roosters, quilts, drawings, jams, and giant vegetables. the floor: a 39-pound turnip, a 168-pound watermelon, an 18-pound carrot, a 39-pound head of broccoli, a 55-pound blue Hubbard squash—it’s enough to keep a family in salad for a year. 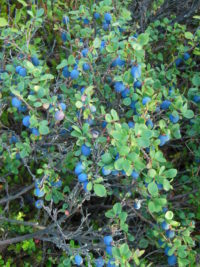 ffee at Vagabond Blues, or hiking in nearby Hatcher Pass. Born in Palmer, Susan Sommer once worked as a ticket seller for the carnival rides at the state fair. 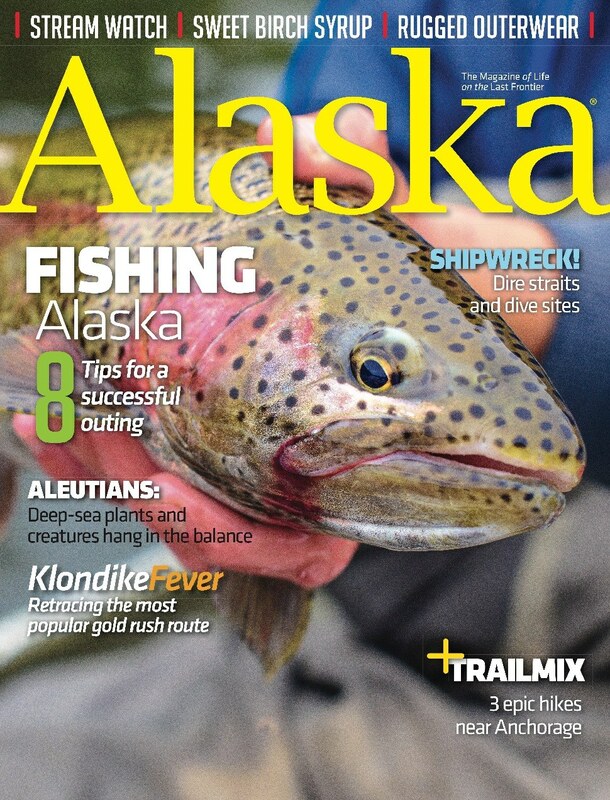 She is now editor of Alaska Magazine.